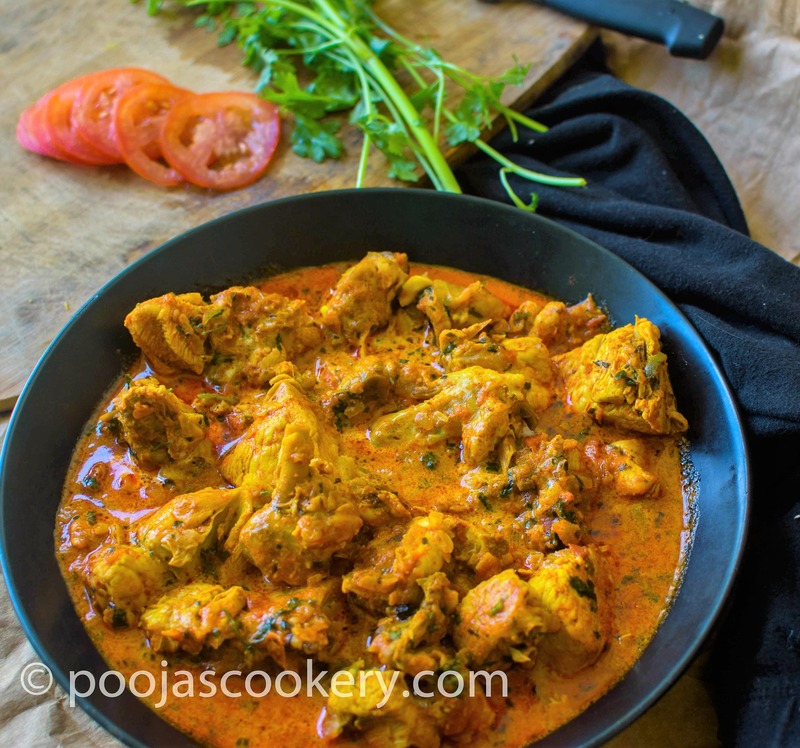 Tandoori Chicken Curry is a simple chicken curry and tastes great with naan or roti. Prepared using homemade tandoori spice. Do you guys ever wonder, what to cook everyday for lunch or dinner? I do ! I always try to get some unique lunch or dinner ideas so as to make my meal a fun meal. Though I try to cut short my cooking time in kitchen, I make sure that whatever I prepare, my family enjoy it. Last week I posted the recipe of Tandoori masala mix and my tandoori chicken was a big hit among many of my friends. I normally use this masala and homemade garam masala in many of my recipes and it just does the wonders . Whenever I am in a hurry, preparing lunch box for my husband in the morning and wonder what vegetable to cook, I sprinkle a bit of these wonder spices over my veggies and it does the amazing job. Chicken curry is one of the best thing to cook. Just like fish, I can literally make any dish out of chicken, because it gets cooked very easily and however you cook it, the outcome is always wonderful. Since Mondays we prefer vegetarian food, I though I would be making chicken today. We have central market here and they sell fresh meat . So, we go once a week to get fish and chicken from there. Since I had freshly prepared tandoori masala, finally decided to make some Indian style chicken tandoori curry. I love boned chicken rather then boneless and love to chew on bones just like my son . 😉 . 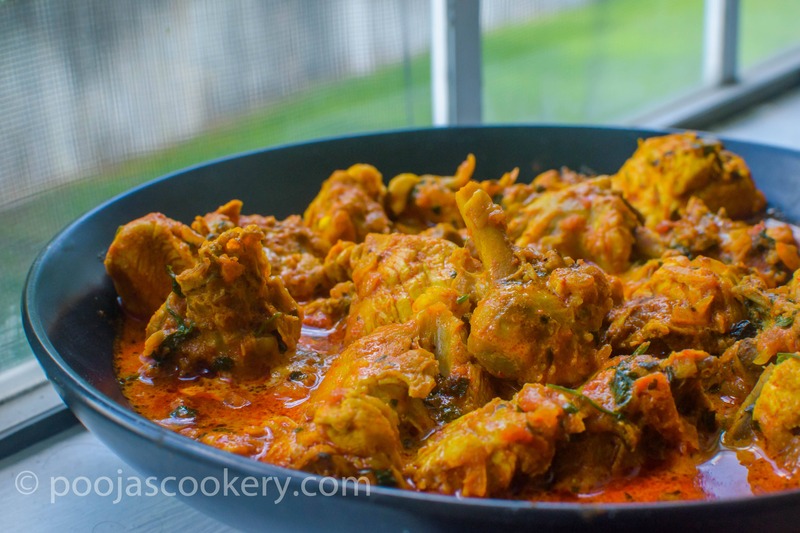 Normally I use coconut for chicken curry but this gravy doesn’t require any coconut and is very simple to prepare. Tandoori masala spice mix will do the job of enhancing the flavor and taste. In a big saucepan kept on medium high heat, add oil and saute all the whole spices for about 2 minutes or until they are nice and fragrant. Add chopped onions. Sprinkle some salt over them and saute until they are nicely browned. This will take 5-6 minutes on medium high heat. Add ginger garlic paste and saute till raw smell goes away. 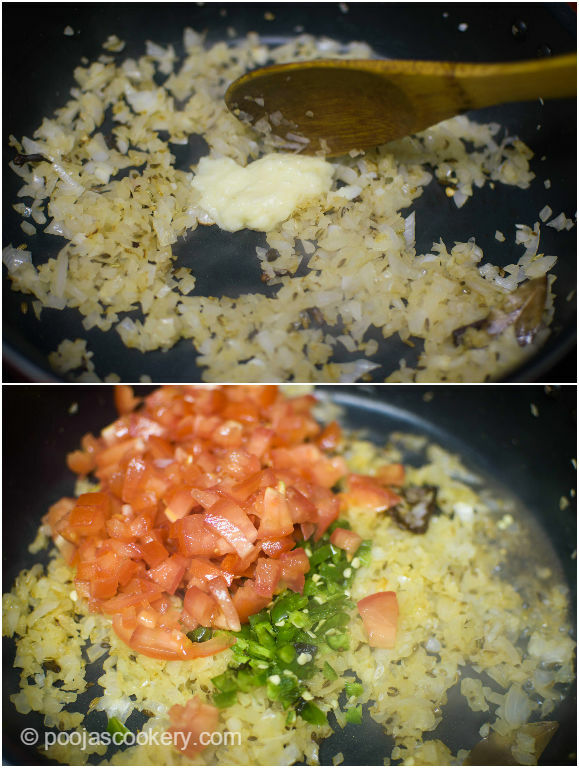 Add chopped green chilies and tomatoes ,mix , cover and let them cook till soft and mushy. Mix well and add water. Cover and cook on medium high heat or 5 minutes. Sprinkle all the powdered spices. Mix well. Cover and cook on medium high heat until the chicken is well cooked . Remove the cover and sprinkle some salt and kasuri methi. Simmer on low heat for another 10 minutes. Switch off the flame . Add milk cream and garnish with chopped coriander leaves. 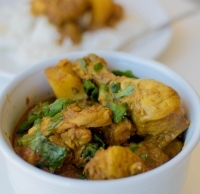 Enjoy this quick, easy and tasty chicken curry with roti, naan, paratha or rice. Your spice mix sounds heavenly! I love chicken on the bone, too. Can't wait to try this out! What a delicious idea for dinner. I love how easy you make this look to make. SO much flavor in that dish! I'm excited it doesn't use coconut as I'm allergic to it. So this is one curry I can actually dig into. Yes, This is really yum recipe. You must try it. This dish sure looks flavorful! I've never made tandoori chicken at home, but your step by step instructions are giving me the confidence I need to give this a try! Thanks a lot The Foodie Affair!! Sure you can come Brian.